Everything was quite good, although I wasn't a huge fan of the turnip greens it was my first experience with turnip greens and they're more bitter than collard greens. In the last few years we have added several items to the menu. The veggies were cooked perfectly and were tasty. The food was outstanding - the turnip greens were seasoned just right along with the beans. The first choice they are going to give you is what kind of bread you want: yeast rolls, cornbread, or mixed. Everyone is very sweet who works here and you should go if your in Spartanburg. But since we eat that way at home every day, when I go out I prefer something fancier and a little higher quality than what I can make and serve easily at home. The mac 'n cheese was very good also - I don't have one complaint about the entire meal. We don't need its content. I had a dynamite salad with very good dressing, husband had pork tenderloin with gravy, green beans, and Mac and cheese. I'll explain the basics, the food is cafeteria style but with a restaurant section. 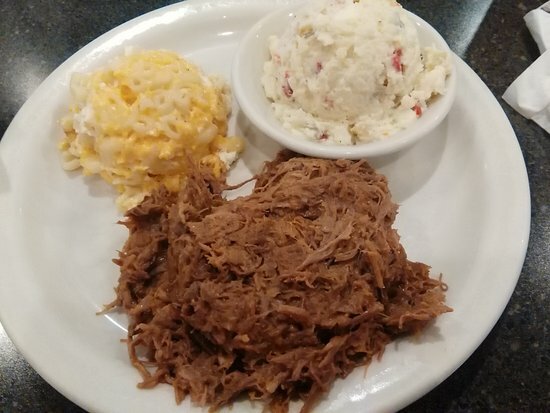 We would like to invite you to stop in and try one of our specialties. Here is how it works: You step into the line and there is a guy serving the meat. I haven't tried a side I didn't like. We serve a full breakfast menu, however, we are especially known for our homemade Raisin Bread and our great omelets. We have been serving breakfast form this location since 1937. All users are free to download and save the Wade's Restaurant menu files, but can not duplicate or distribute them for any commercial use without prior written permission of the copyright holder. Table service is self explanatory but I was unsure what the Express service was. Ya see, the menu rotates everyday and that's the only day I know by heart! On a Thursday I'll get Turkey and dressing with no gravy, sides: turnip greens, Mac-n-cheese. There is no point in recommending this restaurant since it's already a local institution with lines out the doors. Tell your extremely friendly server which meat you want, and then the numbers of the sides. 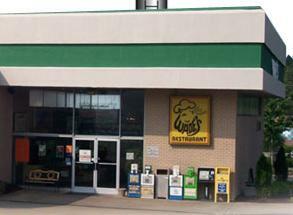 That being said, I can only remember going to Wade's once or twice my entire life. The line out the door should be a clue. There's no reason to talk about favorites because it's all good. Almost forgot: the rolls and corn bread are to die for, no lie!!! The hubs and I love to share, so we tend to order different than each other so we can taste more stuff. One last thing, don't let the line out the door thing scare you, the line usually moves pretty quick. What they mean by country cooking are vegetables that come from a can. Probably one of the best in the area. This is especially good with mushrooms and onions. The line moved quickly and we were seated in approximately 20 minutes. Also said Mac and cheese very good, pork and gravy excellent. The Mac and cheese was different than I'm used to stove cooked is my favorite but baked is nice too and was delightful. I grew up in Spartanburg but left about 16 years ago. I decided on Mac and cheese, peas, and green beans once I found out they weren't cooked in meat. On this particular day, I think we made it from the back of the line at the door to our table in 10 minutes. Since I was in town for the holidays, I decided to get a veggie plate from here on a Sunday after church. It's a family atmosphere so don't expect a glass of wine with your collards but you will not miss it. After being served the meat, you take your plate and two additional bowls to the veggie section where you get as little as you want or as much as can fit on your plate. So great for a family in need or new parents! The meal came with a drink choice I took sweet tea and I decided to order a strawberry shortcake. Also, they have a quick line for lunch time so you can go through buffet-style instead of being seated if you're in a hurry, but like I mentioned, it's fast either way. The line for table service was extremely long so I hide Express. 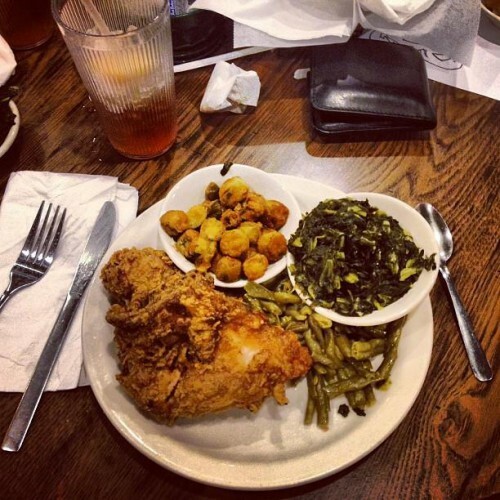 This restaurant is truly a Southern experience in terms of atmosphere and food. The pie was warm, gooey and good. My personal opinion is the food is good every time but not something I would drive very far to have. I'll save room next time. My favorites are green beans, macaroni and cheese, fried okra, turnip greens, sweet potato casserole, hash brown casserole, creamed potatoes with gravy, and creamed corn. There were 30 people outside the door and that means there were about 30 inside the door too! Excellent and quick service, clean surroundings, varied and good menu offerings. 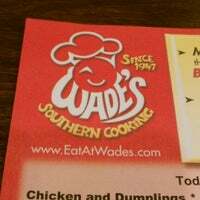 If you're a Spartanburg native or if you've lived here for oh, 2 minutes, then you know Wade's. The hamburger casserole is the best I have ever had. This year we started serving a Steak Omelet.